Large selection of wheelchair inner tubes in stock including inner tubes for manual wheelchairs, power wheelchairs, and mobility scooters. Standard Inner Tubes - Most wheelchairs and scooters today come with air-filled tires that require some sort of inner tube. They come in most sizes and valve configurations (see below). A standard inner tube requires the periodic maintenance of filling the tire with air about once a month (Natural air pressure loss through the walls of the inner tube occur at about 25% per month). If you're unable to use a pump, consider partnering with a friend, loved one, or caregiver to help fill your tires with air. You may also be able to use a solid tire (or urethane tube insert), however keep in mind that not all wheels or casters will accept a solid tire. When selecting a standard inner tube, note the size written on the side of your tire (it may be expressed in standard or metric size, and sometimes both). Also take note of the valve type. Generally speaking, you will choose the valve style you already have. 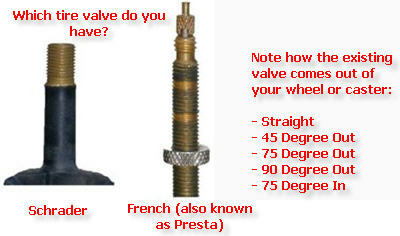 If you are changing from one style valve to the other, make sure you have the correct tire pump or purchase an adapter. Thorn Resistant Inner Tubes - Similar to the standard inner tube, but with an added layer of security to help prevent puntures. Note they are not puncture proof (especially if you run over nails, glass, or other sharp objects). The natural air pressure loss through the walls of this inner tube occur at about 25% per month, so these too require the periodic maintenance of filling the tire with air. When selecting a thorn resistant inner tube, note the size written on the side of your tire (it may be expressed in standard or metric size, and sometimes both). The sizes available are more limited, so your size may not be available. The thorn resistant inner tubes all use schrader valves. High Pressure Inner Tubes - Used mainly with high performance tires. Higher pressure means more performance but can mean less comfort. Like all air filled tubes, natural air pressure loss through the walls of this inner tube occur at about 25% per month, so these also require the periodic maintenance of filling the tire with air. When selecting a high pressure inner tube, note the size written on the side of your tire (it may be expressed in standard or metric size, and sometimes both). Sizing is limeted to larger size tires with 24", 25" being the most common. Most sizes come with either Schrader or Presta valves. Urethane Inserts - These are made from a solid reusable urethane. They replace the air filled inner tube and won't go flat. These are a good option since they use your existing tire, but sizing is limited. Often these are purchased for the peace of mind they provide knowing you won't get a flat. They may be difficult to install and usually require a few insert lever bars to get the last part of the tire over the bead of the rim. Tools needed: A pump compatible with the valve, air pressure gauge (or a pump with a built in gauge), and tire levers. For 2 piece rims, you'll need a phillips or flat head screwdriver. Some 2 piece rims are screwed together with bolts, so you may need a properly sized socket. Remove the wheel from the wheelchair or scooter - never try to change a tire or tube with the wheel on the chair! Let the air out of the tire. For Schrader valves, press the stem in the middle of the valve. For Presta valves, unscrew the top and press in. Once the air is out, press the sidewall of the tire all around to release the bead of the tire from the rim (tire beads can stick sometimes). Using a couple of tire levers, ease the tire off the rim by working the levers under the bead, then moving the lever around the rim until one side of the tire is off the rin. Then to the same for the other bead going in under both from the same side. If using metal tire levers, use caution so as not to damage the rim. Once the tire is off the rim, inspect the rim for damage. If you are replaceing the tube becasue of a flat, inspect the inside of the tire closely to make sure whatever caused the flat is no longer there. Also look at the tire liner if you have one and make sure it is still properly seated on the rim. Inflate the tube slightly to give it a little shape and put the tube into the tire and push the valve through the hold in the rim. Be careful to align the valve stem through the hole so it seats properly later when the tube is filled with air. For a urethane insert, just push it into the tire. Slide the first side of the tire bead all the way around the rim until that side is completely on. You may or may not need lever bars for this step. Ease the second bead over the rim and using lever bars work the bead all the way around the rim until the bead is completely on. You'll need a minimum of two lever bars for this step - one for holding your progress and the other for stretching the bead over the rim as you near the end. Some people will find this step challenging as it can be very tough to lift the last part over the rim. Patience really helps. If you are using metal lever bars, use extreme caution so you don't damage the rim. Once the tire is on the rim, push on the sides of the tire all the way around to make sure the tube isn't bunched up or pinched anywhere. Inflate the tire to the recommended pressure by the wheelchair or scooter manufacturer or the number on the sidewall of the tire. Install the valve stem screw (if your valve has one). Before reattaching the wheel to the chair, visually inspect the tire to make sure the tire seats evenly all the way around the rim - if not, deflate the tube and re-work the tire with your hands to properly properly align, then re-inflate. Lift off the top half of the rim and set aside. If the two halfs are stuck together, you can drop the tire and wheel assembly on to your work surface from about a foot up. Be careful to only drop the assemaly onto the deflated tire only. Both halfs should come apart. If your wheel has bearings and a bearing spacer they may fall out. They can be re'installed later with a rubber mallet once the tire/tube process is finished. Pull the old tube out of the tire and discard. Inspect both halves of the rim for damage and for any debris that may have caused a flat. Inflate the new tube a little to give it some shape and insert into the tire. If you are using a urethane insert, just push it into the tire. Seat the tire ontop of one half of the rim and insert the valve through the hole (for inner tube). Place the top half of the rim onto the assembly and reattach the screws or bolts as before. You want them tight, but do not overtighten. Inflate to the pressure as recommended by the wheelchair or scooter manufacturer or the pressure listed on the side wall of the tire (for inner tube). Visually inspect the tire and wheel to make sure everything is straight and aligned. If not, you will have to deflate the tube, reposition the tire/tube and re-inflate. If the bearings came out during the removal process, you can pound them back in using a rubber mallet (only use a rubber mallet, or a block of wood wrapped in a towel. with a hammer - and use as little force as you need). Make sure to insert the bearing spacer first if you have one. Re-attach the wheel assembly back to the chair. As you can see, changing a wheelchair inner tube or scooter inner tube is much the same as on a bicycle wheel. Obviously if you are in a wheelchair or scooter you probably won't be able to change a tire on your own, but chances are you kwow someone who can. If not, consider contacting your local bike shop as they can probably help.